In 1735, a workhouse was constructed on part of the site of the bishop's palace at Wiveliscombe. A parliamentary report of 1777 recorded parish workhouses in operation at Wellington (for up to 150 inmates) and Wiveliscombe (65 inmates). Somerset: Ashbrittle, Badialton, Bradford, Chipstable, Fitzhead, Hillfarence, Kittisford, Langton Budville, Milverton (3), Nynehead, Oake, Raddington, Runnington, Sampford Arundel, Stanley, Thorn St Margaret, Wellington (4), West Buckland, Wiveliscombe (3). Devon: Burlescombe (2), Calyhidon, Culmstock (2), Hemyock (2), Holcombe Regis. The population falling within the union at the 1831 census had been 20,985 with parishes ranging in size from Badialton (population 98) to Wellington itself (4,762). The average annual poor-rate expenditure for the period 1833-35 had been £11,148. The Wellington Board of Guardians met for the first time on 18th May, 1836, and moved that Mr Richard Carver, County Surveyor, be called upon to give assistance on the subject of a workhouse. Carver produced a satisfactory design which was based on the popular cruciform or "square" model plan issued by the Poor Law Commissioners. On 22nd June, 1836, a building tender from Messrs Hanniball and Bradwell was accepted. The building was erected at a site on the north side of North Street and was completed the following year. The Board of Guardians in 1837 included the Revd WP Thomas (Chairman), P Broadmead (Vice-chairman), W Rodham (Clerk), and the Revd H Barker (Auditor). The workhouse location and layout are shown below on the 1904 map below. 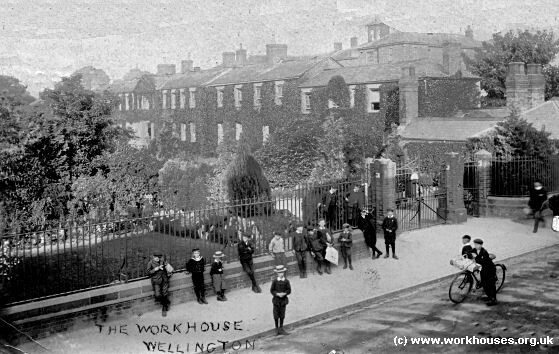 Wellington workhouse from the west, c.1911. The site later became an old people's home known as The Lodge. 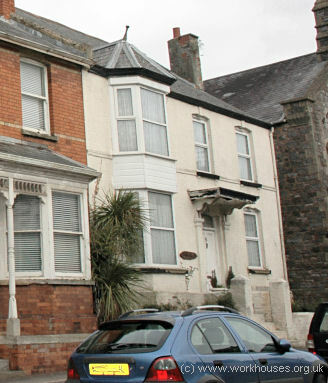 The buildings were demolished in the 1970s and housing now occupies the site. In the early 1900s, the union established a home for 15 children at 5 Mantle Street in Wellington. In 1919 and in 1929, Miss Mary Mabel Yeo was recorded as the home's Matron. Somerset Heritage Centre, Brunel Way, Langford Mead, Norton Fitzwarren, Taunton TA2 6SF. Many records survive including: Guardians' minute books (1836-1930); Births (1867-1943); Deaths (1867-1914); Offences and punishment book (1851-1914); etc.